This hovercart is a great addition to balancing hoverboards.This is a new modern walking tool instead of walking. They are exquisite and fashionable. It has become the new representative of the current trend of the times. ① Front wheel: big wheel with shock-absorbing design, its equally sturdy in poor road conditions. ② Two adjustable length bars: front and back retractable structure. Suitable for people of different heights. ③ Comfortable seat: large comfortable seat, not easy to slip off. ④ Two shock absorber springs: The strength of the double spring can be adjusted according to requirements. ⑥ Applicable to: It can be used for 6.5-inch, 8-inch, 10-inch wheels and other sections of balance hoverboards. 1. If you are a beginner, it is better to wear safety helmets and kneecap to avoid falls and scratches. 2. Don't drive fast, Don't go out on a heavy rain. Don't run on the road full of sand. Don't let children under 9 play on their own. 1 year warranty for this product! We accept return, if it is caused by the product quality or the mistake from us, you will be guaranteed to get 100% full refund. Please feel free to contact us at any time. 【COMFORTABLE DESIGN】It is suitable for both young and old. 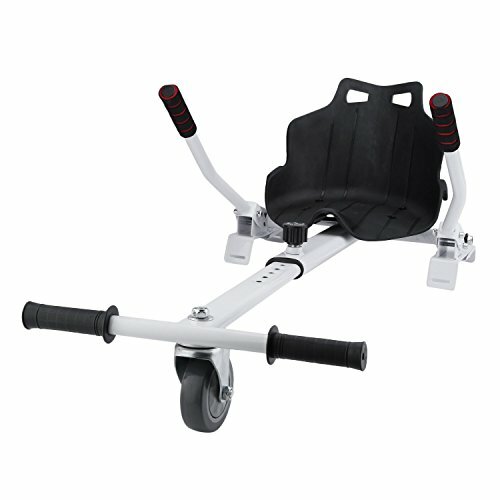 Ergonomic design,anti-skidding and comfortable foam handlebars,antiskid foot stand. Big front wheel shock absorber and comfortable to sit on it. 【RACING FEELING】Racing with your friends through this awesome hovercart. Practicing essential motor-skills. You can feel faster and get you in the feel of racing. 【A GREAT TOY GIFT】 It will be so much fun! It is an amazing ride for your friends and family to enjoy. A great gift for both adults and kids. Everyone will love it! 【WHAT YOU GET】1 x Hoverkart Go Cart , 1 x Accessories Pack ,1 year warranty for this product! We provide the full technical support after selling and any questions about the product. We accept return. If the return is caused by the product quality or the mistake from us, you will be guaranteed to get 100% full refund. Your satisfaction is our biggest motivation. Please feel free to contact us at any time.